This book has elements of the Robert Ludlum books about Jason Bourne, with a little bit of Grosse Point Blank thrown in. Columbus is a top flight hitman, who suddenly becomes the target himself. He is given his assignments by a fence named Ryan. The thick folder that Ryan provides contains as much detailed background information as possible, that can be gleaned about the 'mark'. It also helps Columbus 'make a connection' with his target' so that he can 'sever the connection' by killing them. Of course, all his targets are bad guys that the world is probably better off without. Unfortunately, in killing one of his targets, two innocent pedestrians are killed in the process, and this has to be where his own bad luck begins; the tables are turned, and he becomes the target. Thrown into the mix is a woman called Risina, with whom Columbus starts a relationship. His feelings for Risina start to make him question his lonely and dangerous lifestyle, and whether or not it might be time to move on. But first, he has to find out who wants him dead, and make sure the contract is voided, one way or another. 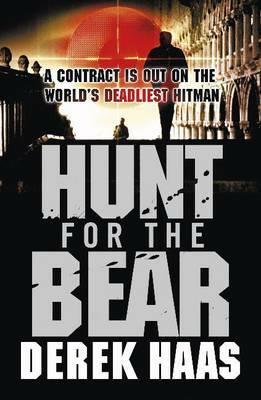 HUNT FOR THE BEAR is a pretty straightforward thriller that is stylishly written, and could easily be the makings of a film. Possibly not surprising, as the author is a Hollywood screenwriter, and has even adapted one of Robert Ludlum's books for MGM. Columbus is a very cool, even headed assassin, who likes to dig deep inside the psyche of his targets, and meticulously plans his every move. There is nothing really novel about the book, and the plot pretty much proceeds as one might expect. There are some annoying jumps in the timeline sometimes, even from one paragraph to the next in a single chapter. Overall Columbus is an intriguing character, the violence is pretty sanitised, the story is a good one and it's a entertaining read.